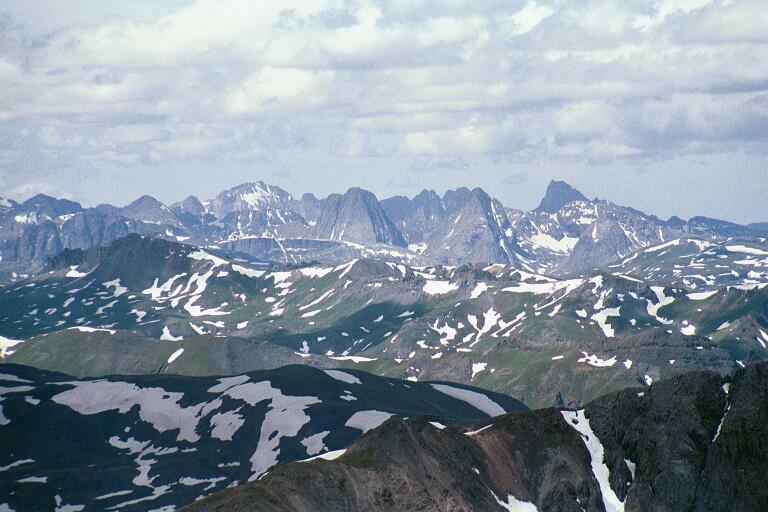 Saddle is a distinct pass on the Continental Divide north-east of Highland Mary Lakes. The higher peak is Sunlight Peak. How to get there: Lake City is the natural reference location. Go south on Hwy. 149 approximately 3.5 km, then turn right onto the road to Lake San Cristobal. Drive around the lake and continue up the valley on a good dirt road. A little more than 19 km from Hwy. 149, the road forks and there are signs saying Silverton, Cinnamon Pass, etc. This is the right fork that heads uphill. Continue about 6.5 km on this road. The Silver Creek trailhead will be obvious, there is a separate parking area on the right hand side of the road as well as an outhouse (on the left hand side). The trail to Handies starts on the left hand (west) side of the road and heads up the valley (west). 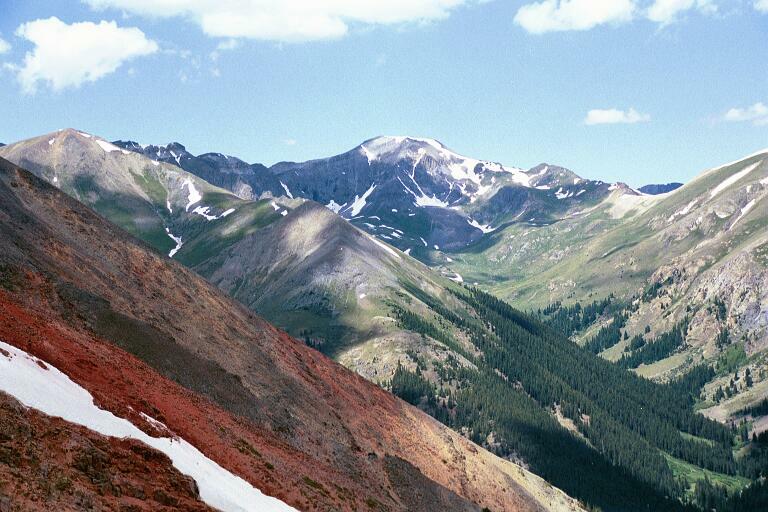 Route description: The standard route from Silver Creek trailhead to the summit is a good trail (class 1) all the way. However, this description will cover the route from Point 13795 to Handies Peak, a key segment of our "Tour de Handies". See the description under Point 13795 for the first part of this route. From Point 13795, descend back to the level ridge and head towards Handies Peak. This hike first passes a small rock point, then climbs gently to Point 13700 (4176 m). From here the ridge descends fairly steeply and partly on loose rocks to the lowest connecting saddle at 4054 m. From here, climb near the ridge (on the left side) on quite good rock to Point 13735 (4186 m). After a short descent from this point one (finally!) reaches the southeast ridge of Handies Peak. From this point, much to my surprise, there is a marked trail, first on the left side of the ridge, later along the main ridge up to the summit. From the summit, we hiked back along the standard trail. This trail is in good shape, class 1 all the way with the possible exception of about 20 m where the trail is steep on loose sand, going straight down the hill instead of a couple of switch backs. 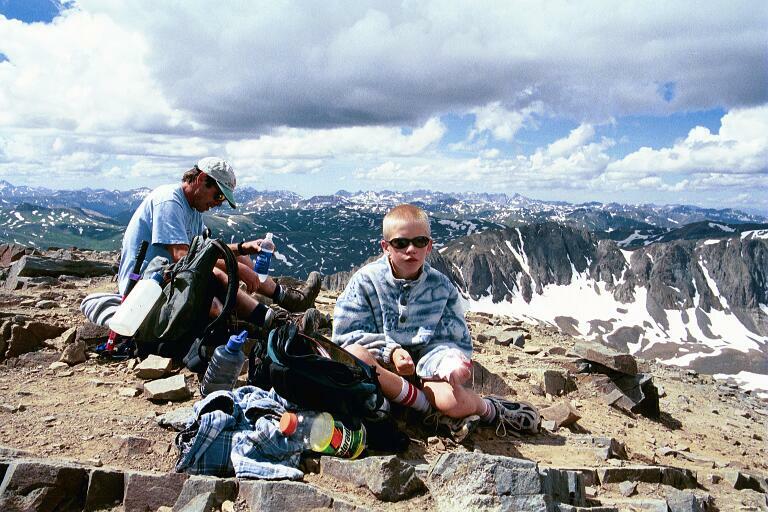 Comments: I did this climb with Pål Jørgen, age 12. 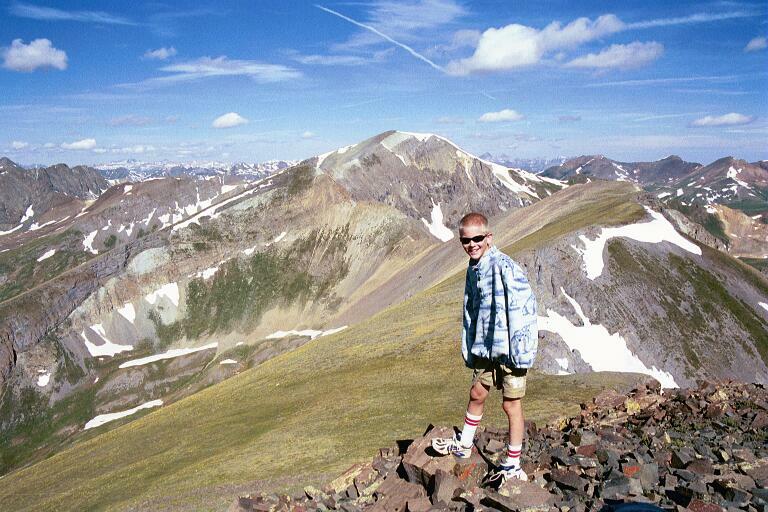 This was his 35th Fourteener. The hike from Point 13795 to Handies Peak took a bit less than one hour, we were on Handies around 1030. 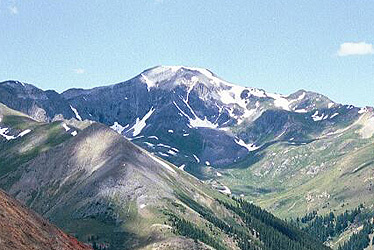 The view from this peak is very famous, peaks of the San Juan in all directions. We started down after about 40 minutes on the summit and were back at the jeep at 1230, the complete "tour de Handies" being five and a half hour. Handies Peak, seen when descending from Sundog. The ridge from Point 13795 to Handies Peak. On the summit of Handies Peak, a sea of mountains everywhere. View from the summit of Handies Peak, the Needles area, but which peaks can be seen and what is the name of the large one on the right?